Subterranean termites don't stand a chance. We'll inspect your home annually for signs of trouble and guarantee that you won't pay for termite treatments or damage repairs as long as you keep your plan. IT’S THE TERMITES THAT PAY. We’re your strongest weapon against subterranean termites. Once termites are out of your home, we’ll monitor annually to check for any signs of them trying to sneak back in. And in the unlikely event that they do come back, you’re covered against future treatment and damage repair costs. Guaranteed. We perform a FREE Termite Inspection to determine if your home is free of subterranean termites and eligible for coverage. Each year, we perform another inspection as part of your plan’s renewal to confirm your home is still termite-free. If termites are discovered during this re-inspection, we’ll treat your home to quickly eliminate termites at no additional cost and you’re covered against the treatments and damage repair costs. 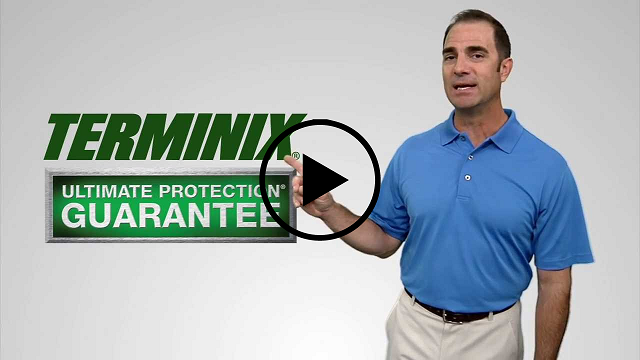 For as long as you keep your plan, you are covered by the strongest guarantee in the business – the Terminix Ultimate Protection® Guarantee3. That’s it. You don’t have to do anything else. But if termites dare show any sign of activity between your inspections, call us. We’ll re-inspect right away and stop them in their tracks. CLICK TO SCHEDULE YOUR FREE INSPECTION TODAY. 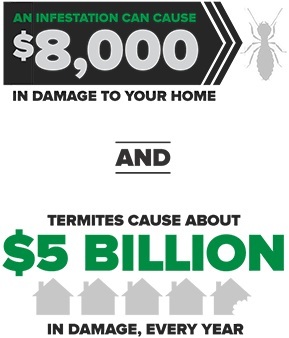 A FREE Terminix Termite Inspection is the first step to protecting your home from termites. During a termite inspection, a trained Terminix specialist will thoroughly inspect your home for any signs of termites and identify potential access points. They will work with you to keep your home termite-free and save you from treatments and damage repairs that can cost you thousands. Looking for fast, effective commercial termite treatment? Don't worry, Terminix Commercial has you covered. THE STRONGEST GUARANTEE IN THE BUSINESS. You’ll never pay for future termite treatments or damage repairs as long as you keep your plan. Treatments and repairs can be costly. The Subterranean Termite Coverage Plan will keep termites from taking a bite out of your bank account. With the Subterranean Termite Coverage Plan, the chances of spotting any termite invaders before they become a problem will greatly increase. We’ll also help secure any vulnerabilities as they pop up. That way, they can’t sneak in and eat away at your home for months or even years before they’re spotted and stopped. 1 If within 30 days after an inspection or treatment you aren’t totally satisfied, we will refund the treatment or coverage charges, reimburse any prepaid services and cancel your plan. 2 Avg repairs: $7,184 from 2011 survey by Decision Analysts for TMX of independent contractors in the TMX network. Estimated treatment: $1,000. Every home is different; repair costs may vary. 3Ultimate Protection Guarantee (UPG) is specific to the termite or pest plan purchased. Consult your plan for specific terms and limitations that may apply. Not available in all areas. For complete offer terms, including coverage areas, or for details regarding any Terminix guarantee, call 1.800.TERMINIX (1.800.837.6464). Termite plans require annual inspections and payments to be current. Termite plan UPGs vary by plan and type of termite. UPG IS AVAILABLE FOR QUALIFYING PROPERTIES ONLY. UPG IS NOT AVAILABLE FOR SERVICE PLANS. Any future treatments and/or damage repairs require the presence of live termite activity. Termite inspections are not intended as reliance for representations at real estate closings.